Rebecca Johnson teaches courses in Middle Eastern literary and cultural studies with a special focus on modern Arabic literature. 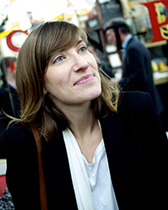 Her research focuses on the history and theory of the novel in Arabic and English, the literature of the nineteenth-century period known as the Nahda, and literary orientalism and occidentalism, and her wider interests include pre-modern Arabic prose genres, cosmopolitanism, and the poetics and politics of translation. Her current book project studies the intertwined early histories of the Arabic and English novels, using translation as a lens through which to understand the form and function of the genre. Professor Johnson has been a fellow of the American Council of Learned Societies, the Social Science Research Council, the Council for Library and Information Resources, and the Fulbright Foundation. She has also published translations of Arabic literature; her translation with the author of Sinan Antoon's I'jaam: An Iraqi Rhapsody is available from City Lights Books. “Importing the Novel: The Arabic Novel in and as Translation.” Novel: A Forum on Fiction 48.2 (August 2015): 243-260. “Beautiful Infidels: The Western Travels of The Arabian Nights.” Eighteenth Century Studies 46.3 (Spring 2013). “The Politics of Reading: Recognition and Revolution in Jabra Ibrahim Jabra’s In Search of Walid Masoud” in Recognition in Narrative, Film and Music: Interdisciplinary Studies on Anagnorisis, eds. Philip Kennedy and Marilyn Lawrence (New York: Peter Lang Publishing, 2009), 178-192. “Lineages of the Novel: The Arabian Nights and Arab-European Literary Influence” coauthored with Katie Trumpener and Richard Maxwell. Modern Language Quarterly 68.2 (2007): 243-279.